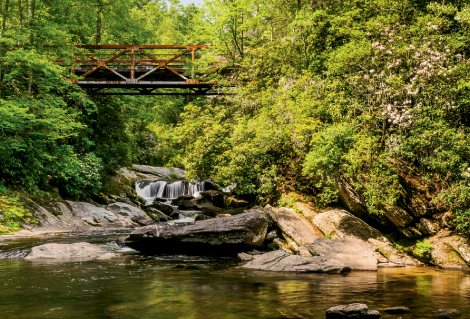 The 21-mile upper section of the federally sanctioned Wild and Scenic Chattooga River tumbles and squeezes through the steep, forested escarpment south of Cashiers. While the lower stretch of the waterway in South Carolina is known for white-water sports, the river’s beloved headwaters, flanked by steep ridges, are more remote. To explore the serene river gorge, begin at the marked trailhead near Bull Pen Bridge, the site of a popular swimming hole. Mostly buffered from the river by a heavy shroud of forest, the rooty trail snakes through the gorge’s rugged geography and over numerous diminutive tributaries that form the river. At times, the footpath meets the water, making it possible to wade among slabs of rock polished smooth as ice. The trail steadily climbs upstream, and at 1.25 miles, it crosses Cane Creek via an iron bridge. In another mile, a second arched footbridge marks the junction of the Chattooga and Norton Mill Creek. The site of the confluence is a paradise where a side stream elegantly pours into a pool through a wall of sculpted stone. You can continue on, or backtrack to Bull Pen Bridge for a 4.5-mile round-trip. Navigate: From Cashiers, follow N.C. 107 south for 7 miles. Turn right on Bull Pen Road (S.R. 1100), which turns to gravel and crosses Bull Pen Bridge in 5.3 miles. There is a small parking area at the trailhead.